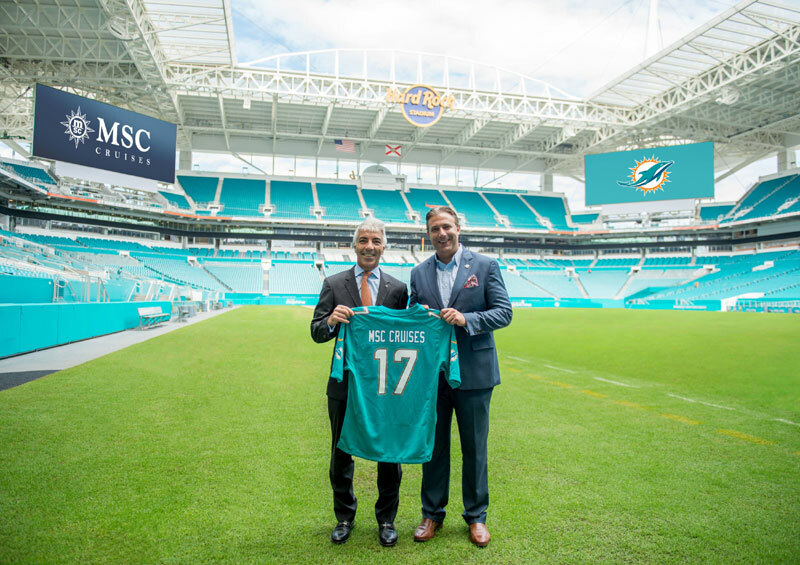 MSC Cruises has partnered with Miami Dolphins which is an NFL Football team in Miami, Florida. The cruise line has announced a three-year partnership with Miami Dolphins. The new partnership brings several new benefits to the fans of the NFL team and MSC Cruises. The announcement comes just before the cruise line launches its brand new cruise ship MSC Seaside from its upgraded cruise terminal at Port Miami. MSC Cruises is dedicated to South Florida with the popular Miami Dolphins brand. The cruise line is expanding in North America not just with the upcoming MSC Seaside but also with MSC Divina which already sails from Port Miami. The partnership will also help promote the expanding MSC brand in the region to fans in the Hard Rock Stadium. See a life-like version of MSC Seaside! Guests can come “on board” MSC Seaside with a 12 ft. high, 14 ft. wide model of the aft of the ship and take a photo with Miami Dolphins Cheerleaders and the beloved mascot T.D. before kickoff. Cheer during MSC Cruises’ Fourth Quarter rally! Guests will hear the iconic cruise horn and watch Miami Dolphins Cheerleaders take the field with MSC Cruises flags. Stay charged all day with MSC Cruises interactive cell phone charging stations around the stadium. See their photos featured on the stadium video boards by submitting game time snapshots via social media and using #MSCSeaside. Sail with Dolphins legends onboard MSC Seaside: Fans have the chance to experience the Miami Dolphins at sea and meet team alumni on a themed cruise on MSC Seaside in 2018. Relish a rivalry game with MSC Cruises. MSC Cruises will be the presenting sponsor of the Miami Dolphin’s 2018 regular season home game at Hard Rock Stadium against New York Jets. MSC Seaside will begin Caribbean cruises from Miami in December 2017 and will join MSC Divina. Another new cruise ship the MSC Meraviglia will also offer sailings from North American from 2019.